Students from WIC @ UCSD, a women in computing organization here at the Jacobs School, got to meet a UC San Diego alumna doing unique work at the intersection of engineering and art April 14 at the init(together) conference at the University of California, Irvine. Janet Hansen got her Ph.D. in applied mechanics and engineering science as well as bioengineering from UC San Diego. 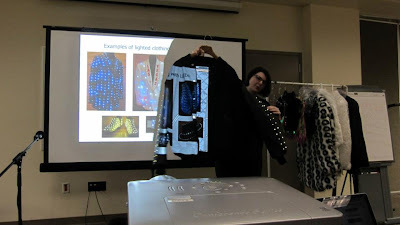 In 1998, she founded Enlighted Designs, Inc., a company that specializes in making custom lighted clothing, mostly for performers, including Britney Speaks, Katy Perry, Pink, Rihanna and Ke$ha. 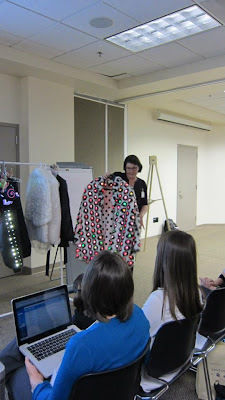 Hansen showed off some of her designs to the WIC students, who snapped pictures. See some examples below and click here for a more complete gallery of Hansen's wares on her company's website. 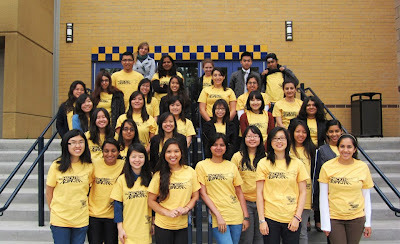 The WIC @ UCSD members ready to embark on their trip. Many threats to public health, including bacterial infections and biological weaponry, often rely on pore-forming toxins for their virulence. Anti-virulence therapy, which targets these toxins, offers a way to detoxify the body and attenuate the effectiveness of the underlying threat. Existing platforms, including anti-sera, monoclonal antibodies, and molecularly imprinted polymers, have all been used effectively for this purpose, but they all require customized synthesis schemes for application against each individual type of toxin. We have developed a biomimetic toxin nanosponge targets the action mechanism of pore-forming toxins, and thus is applicable for the detoxification of a wide array of toxin types without the need for customized synthesis. The nanosponge is made by coating red blood cell membranes onto the surface of polymeric nanoparticle cores, and acts by absorbing membrane-damaging toxins and diverting them away from their intended targets. Using a murine model, it was demonstrated that these nanosponges are able to significantly increase the survival of mice challenged with a lethal dose of staphylococcal alpha-hemolysin (α-toxin). This rationally designed, bioinspired platform has the potential to be used as a treatment against a variety of diseases that employ pore-forming toxins. Parts of this work were published last week in Nature Nanotechnology. Check out the Jacobs School press release on related work. From left: Lauren Cwiklo, another student and Nate Delson, a lecturer in the MAE department, look at a hard drive. What's in a hard drive? A lot of lessons in good design, it turns out. 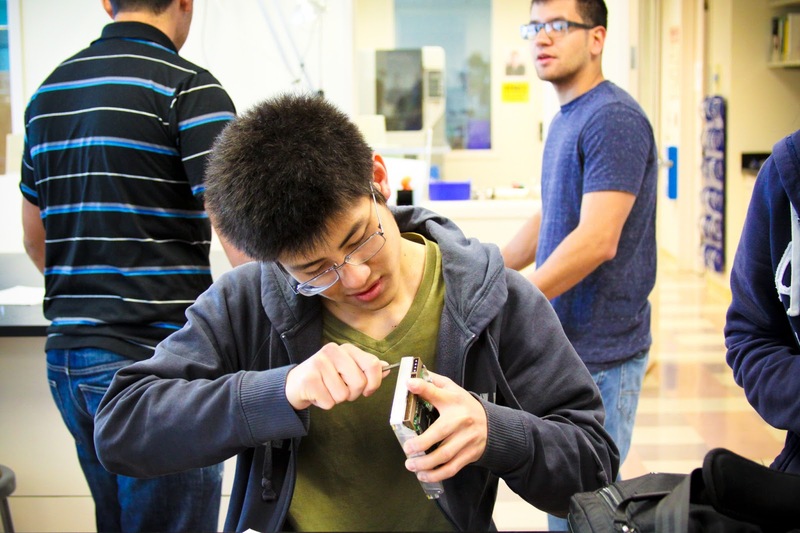 That's what Nate Delson, a lecturer in the Department of Mechanical and Aerospace Engineering, wanted to teach a group of students who turned out for a "hard-drive dissection" session in the Design Studio at EBU II Thursday, April 18. "Hard drives are fascinating," Delson said. They're probably the most precise devices anyone has in their homes, Delson added. "There's a lot of very precise design and machining that goes into a hard drive," he said. He added he hoped taking apart the hard drives would teach students about good design practices. Mechanical engineering students weren't the only ones to turn out for the session. Students in environmental engineering, engineering science, cognitive science and bioengineering turned out too. 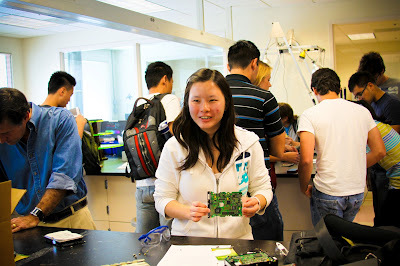 "It's really interesting to see how stuff works," said Priya Bisarya, a bioengineering major. The exercise took her back to a childhood memory, when she and her father took apart the family's VCR. Chris Cassidy from the Department of Mechanical and Aerospace Engineering provided power supplies and use of the Design Studio for the session. Earl "Bucky" Reed, from the Office of Engineering Computer, provided the hard drives. The session's student coordinators were Ngoc "Naomi" Diep and Jake Malone. 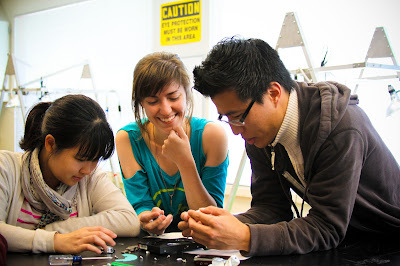 From left: Kelly Mark, Miranda Bohm and Brian Kim examine a hard drive. Masato Koizumi uses a screwdriver to open a hard drive. Elioth Fraijo opens a hard drive. 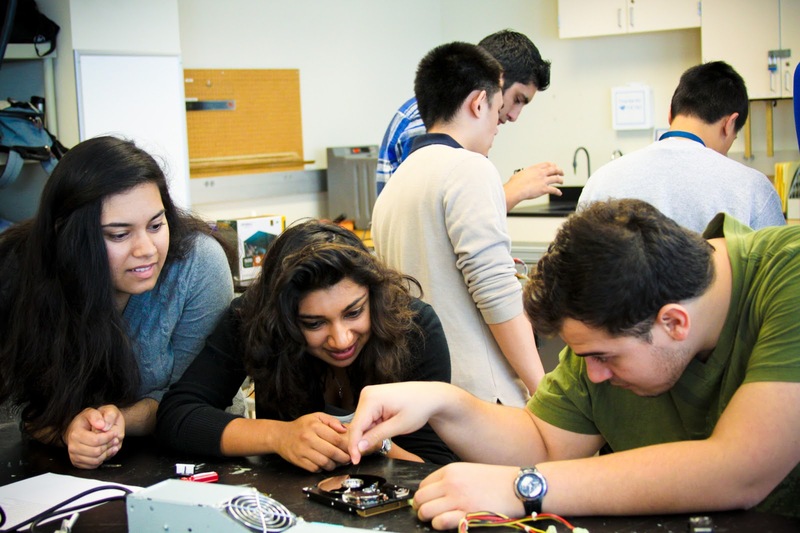 From left: Tanima Shukla, Priya Bisarya and Fabian Ramirez examine hard drive components. Pauline Laikijrung poses with a hard drive component. Below is the nanosponge video that we worked on, to go with the press release. This particular project is one of what is likely an ongoing series of projects that highlight the exciting ways that red blood cell membranes can functionalize nanoparticles. This work follows up on the 2011 research by the same team of nanoengineers. That work was published in PNAS. At Research Expo this Thursday, two different aspects of this work will be presented at the graduate student poster session. On-site registration for Research Expo is the way to go b/c online registration closed yesterday. Esper is one of the 200+ grad students presenting their research projects at Research Expo on April 18, here at the UC San Diego Jacobs School of Engineering. Register for Research Expo here. UC San Diego alumni receive half-price admission. Employees of CAP member companies receive 2-for-1 admission. CodeSpells is a 3D immersive video game designed to teach CS1 level programming concepts to novice students. It is meant to be a stand alone system that guides students through CS1 concepts in a explorative way, encouraging students to engage in pre-defined ?quests? that address particular concepts, but also informally through exploring the 3D world. There have been results to indicate that CodeSpells is a system that is engaging for students ages 9-24 who are complete novice programmers, interested in programming. Early results indicate that little external help is necessary for the students to complete the pre-defined challenges. This study aims to determine what kind of help is necessary as well as how much learning occurs in normal game play. The Audacious Speculations event at UC San Diego will consist of a series of short, performative presentations on research that is so ambitious people often roll their eyes in disbelief, including activist projects that transform the socio-political landscape, or scientific research and experiments that are particularly poetic or speculative, and more. Documenting both existing and speculative work, the presenters include engineers who think like artists; scientists who think like poets; physicists who think like dancers; and artists who think like scientists, hypnotists – even like foxes. 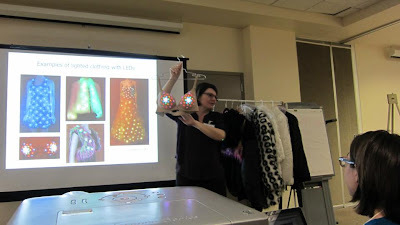 The evening will include presentations on movies for monkeys; a gestural language of physics; tracking trash in Tijuana; hypnosis; butterflies without borders; beautiful brains; biomimicry; smart underwear; finding your bliss; new silhouettes; and a fashionable approach to science education. Click on PRESENTATIONS for program details. There will also be a live webcast and video archive...so if you stumble upon this post after the April 12 event, you can still enjoy it. Advances in tattoo sensors for health monitoring, on-chip optical networking, low-cost cancer diagnostics, video games designed to teach computer programming, new materials for protecting soldiers from blasts, and energy-efficient high-wire robots. 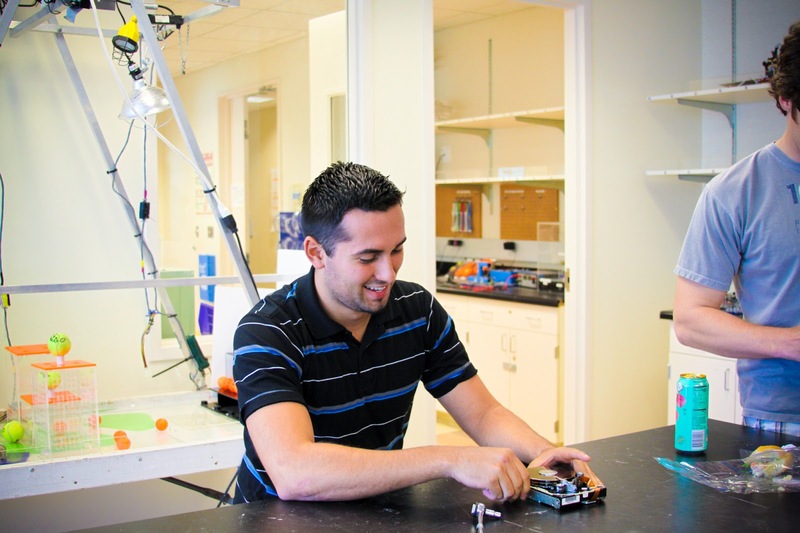 These are just a few of the 200+ projects from Jacobs School of Engineering graduate students that will be on display at Research Expo on April 18 at the University of California, San Diego. 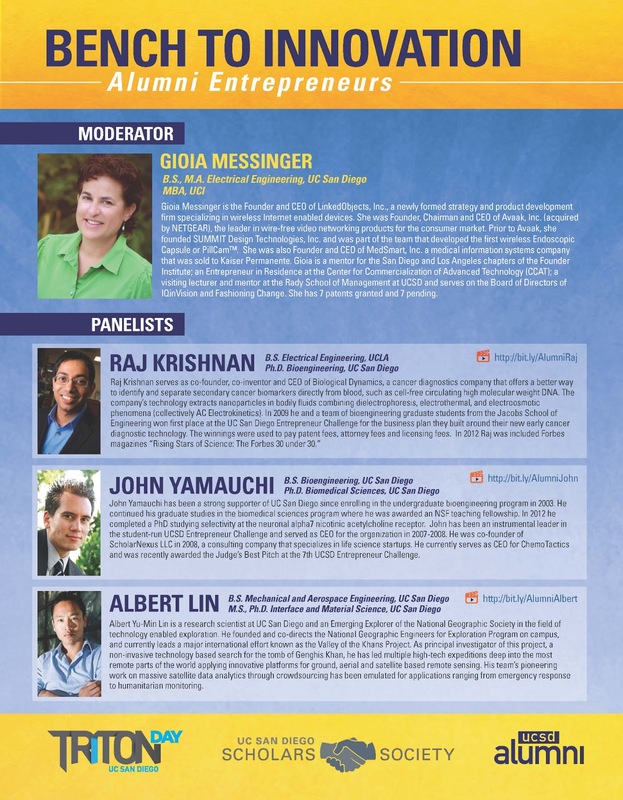 Research Expo is April 18th from 2:00‒6:00 p.m. at the Price Center at UC San Diego. Tattoo sensors for health monitoring, from the lab of NanoEngineering professor Joseph Wang. 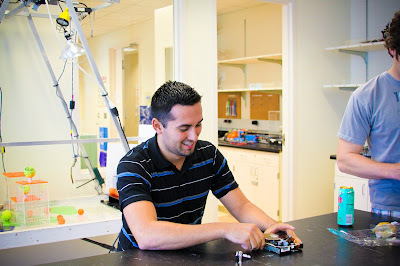 Jaime Meriwether, NanoEngineering undergraduate and a team lead. A few shots from the "Allergen Detection Device" team at the design competition of the Electrical and Computer Engineering Department, on Warren Mall today. This was part of the campus wide Triton Day at UC San Diego. The team showed off their allergen detection device prototype...which is just one of the many possible applications of the technology they are developing: an automated ELISA assay and detection device. You hear the word "interdisciplinary research" thrown around all the time, but the students highlighted how this project was the real interdisciplinary deal. 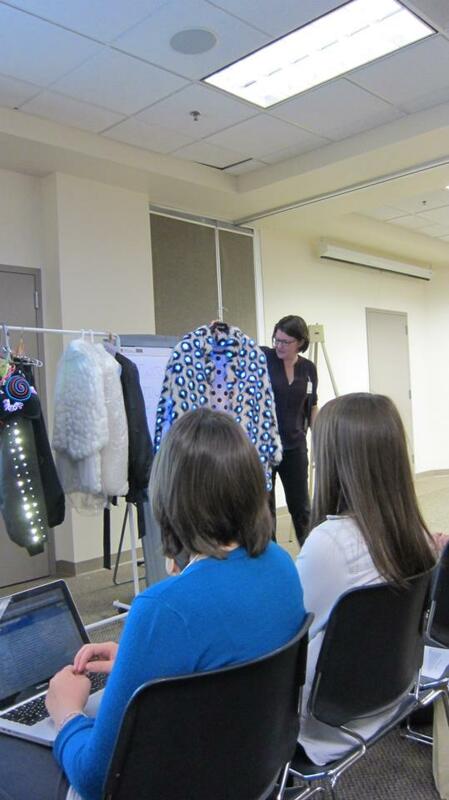 I had to leave the event before the winning design team was announced...stay tuned to find out which ECE team won. "Mapping the brain is wave of the future." That's the headline to Gary Robbins' story in the San Diego Union Tribune describing President Barack Obama's announcement of BRAIN (Brain Research through Advancing Innovative Neurotechnologies) Initiative. UC San Diego and others on "the Mesa" including the Salk Institute for Biological Sciences are going to be deeply involved in this project. Mike Freeman had a related story in the UT: "Qualcomm joins Obama's BRAIN project"
The UC San Diego story on the BRAIN Initiative will break tomorrow ran in our weekly This Week @ UC San Diego digital news magazine. We'll add that link as soon as we have it. 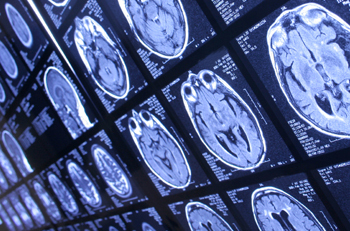 Check out brain-related research at Research Expo on April 18 here at the Jacobs School. A number of the posters from Bioengineering are tied to the brain. But dig into the 200+ posters. I'm sure you'll find more connections. Here is a story and video from the White House: "BRAIN Initiative Challenges Researchers to Unlock Mysteries of Human Mind"
Find out what it takes to start your own company! Have you ever wondered how lab technologies and techniques become the next hot commercial product or service? Is there a technology that you want to license, or see as a future possibility? Are you interested in how start-up companies are formed? Are you aware of your legal rights and responsibilities throughout the tech-transfer process? 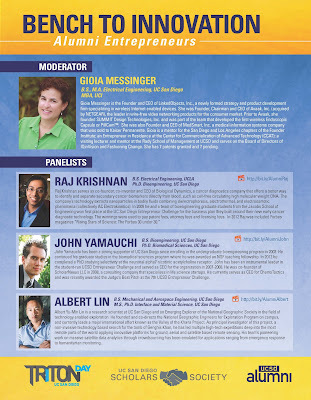 Answers to these questions, as well as many others, will be addressed by a panel of UC San Diego alumni innovators involved in different phases of the tech-transfer process—from “the bench” to leading a successful industry startup! A free, open event, but space is limited. Sponsored by UCSD Alumni, as part of Triton Day 2013!